Even if you’re not shopping for houses, it’s fun to see what kind of digs you can get at various price points in different neighborhoods. We asked local realtors to give us some current and recent listings to get a sense of how much bang you can get for your buck in Washington these days. Information courtesy Urban Brokers, LLC. This charming two-bedroom, one-bath home in Takoma (D.C.) features a lovely front yard with a screened-porch entryway, perfect for cool relaxing evenings. Upon entering the home you will be led into a spacious living room with an attractive wood-burning fireplace. Gorgeous original hardwood floors complement the 1930s character and finishes throughout the home. The kitchen leads into a sizeable dining room on the back of the house and two generous bedrooms on the main level with ample closet space throughout. Downtown Takoma Park with its shops and restaurants is a 10-minute walk. Welcome home to this quintessential Chevy Chase bungalow. The main level of this charming abode features a spacious entry foyer with amazing bay window peering out onto beautiful Stephenson Place. The room has two entrances into the home’s formal living/dining area each with beautiful 15-light doors. The large combined living and dining area boasts a wood-burning fireplace flanked on either side with terrific built-in bookcases. The dining area adjoins the galley kitchen that leads into the home’s family room and has light-colored cabinets, granite counters and stainless-steel appliances. Generously sized, the family room is flooded with natural light from its three exposures reflecting gorgeous slate floors, providing easy access to the home’s lovely backyard. It offers easy access to Rock Creek Park, Lafayette Elementary School and the Chevy Chase shops and restaurants. This spacious retreat features two large bedrooms, two full bathrooms, expansive living area, modern kitchen and wired sound system throughout. Upon entering the unit you will first notice the rays of natural light that reflect on the gorgeous hardwood floors. The living area features exposed brick, nine-foot tray ceilings with recessed lighting, fine attention to detail and a dining area surrounded by four large windows. 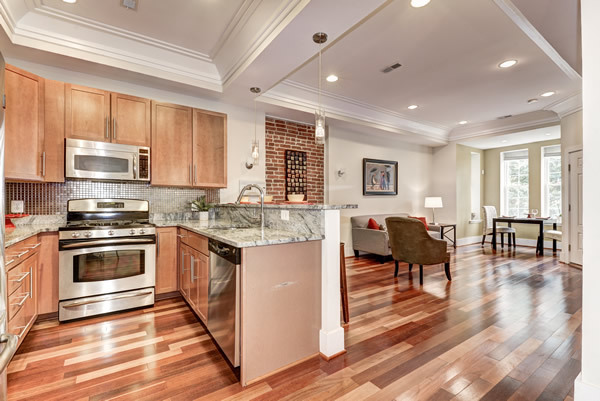 This space is open to a beautifully updated kitchen, complete with bar stool space, granite counters, crown molding, tile backsplash, and stainless steel appliances. A wine nook makes entertaining a breeze and adds extra storage to the property. Meridian Hill Park is two blocks away. 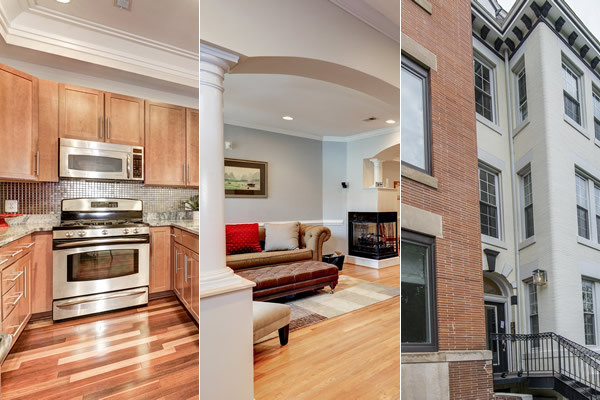 Surrounding neighborhoods include Dupont Circle, Logan Circle and the U Street corridor. Built in 1913, this spectacular and unusual 25 foot-wide rowhome was entirely renovated down to the studs and converted to a two-family home in 2003. Since then, the current owner has completed countless upgrades to the property including a gorgeous expansion and upgrade of the kitchen, attractive hardscaping of the rear patio and steps, a roll-up garage door, new vanities, tile and hardware in the bathrooms, custom built-ins, and more. 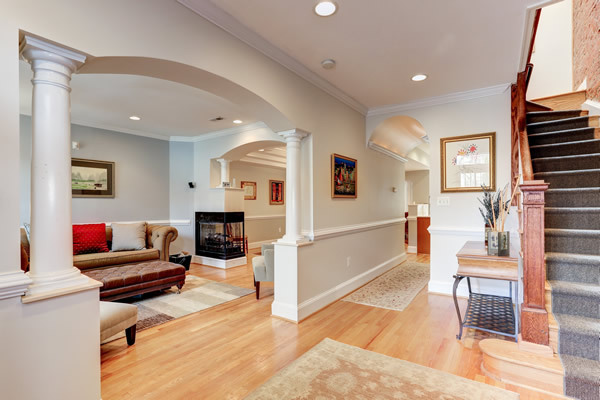 The main level of the home boasts an inviting entry foyer, spacious living room, large combined dining room and kitchen, and connecting den. Special features include hardwood floors, gas fireplace, chair and crown molding, arched passageways, tray ceiling, custom window treatments, recessed lighting and a coat closet. It offers easy walking access to the U.S. Capitol, all Senate and House buildings and Eastern Market.